How Do I Remove a Cooking Grease Clog? To remove a cooking grease clog and prevent the greasy clog from coming back as often, choose the right drain cleaner. 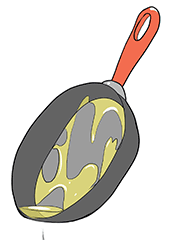 Cooking grease often builds up on the sides of drain pipes, making it difficult to remove with plungers, drain augers, and most other plumbing tools. 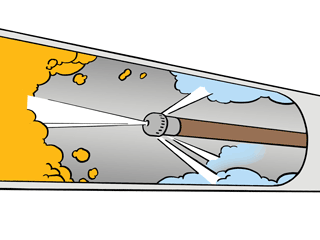 Fortunately a sewer jetter can scrub away sticky grease from drain pipe walls and flush out the residue, so fewer clogs return. 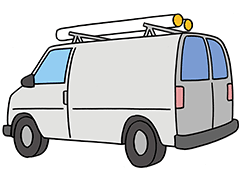 Important: you should consider using a sewer jetter only if you have an alternate, clogged drain opening that you can use in case the sewer jetter can't pass through any short-radius elbows close to first drain opening that you try. 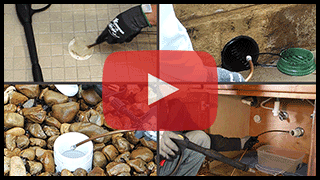 You can see the differences between a mechanical drain auger and a sewer jetter as they both take on a greasy clog in this 2 minute video. Feed the drain cleaner into the drain opening as you squeeze the trigger. Every few feet you should pull back about halfway and then continue moving forward to thoroughly scrub the grease off the sides of the drain. You can also use a sewer jetter to unclog a main drain that's blocked with cooking grease. Note: it's often easiest to clean a main drain by starting from a drain cleanout that's downhill from the clog. You should also have an alternate drain opening available that's upstream of the clog in case the sewer jetter can't reach the problem areas from the main cleanout. 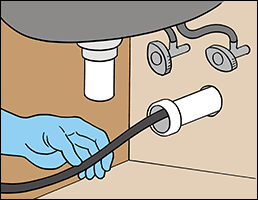 Feed the drain cleaner into the drain opening as you squeeze the trigger to maintain the flow of water. 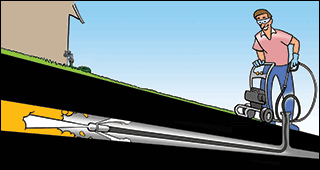 Every few feet, pull back about halfway and then continue moving forward to thoroughly scrub the sides of the drain. 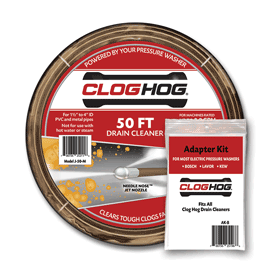 For detailed help, visit our unclog a main drain tips page.